On January 23, 1938 a tremendous amount of ice filled the gorge immediately below the falls. This build up of ice eventually toppled at 4:20 pm on January 27th the Upper Steel Arch Bridge (also known as the Honeymoon Bridge). The bridge (see it collapsed on the river ice) remained on the ice for nearly three months before finally sinking into the Niagara River on April 13th, 1938. 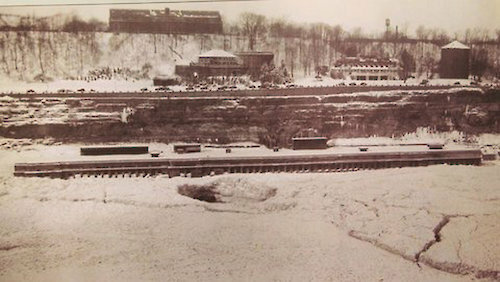 Here’s another photograph of the Ontario Power Company’s generating plant below the falls surrounded by the river ice. This plant is still here today but has been out of operation for many years. It’s now owned by the Niagara parks Commission and its fate is still unknown.